In music, counterpoint was used as a pedagogical tool. Students were put through a strict and rigorous regiment of exercises where they had to create lines of music according to the rules. The rules are incredibly detailed, governing everything from the space between notes, their direction (moving up a scale or down) and how the melody must end. This teaching method is divided into 5 species or levels of difficulty with the last being a culmination of the first four. For our purposes, we don't have to create our own levels of a given game. However, organizing the arrangement of level elements by a criteria that is similar to the one that music students used with counterpoint will be very beneficial. Though these rules are still being formulated, keeping these ideas in mind is a step in the right direction. The beginning and the end of a level must be easily identifiable to define the level. Only use unison (a single game idea) at the beginning and/or end of a level. Unison scenarios don't count as multiple game ideas. ie a Goomba at the bottom of a pit doesn't count. The pit would be jumped anyway. Therefore the Goomba's presence is then moot. Have as much contrary motion as possible. ie if the Goombas are going down, then Mario should be going up. If Mario needs to move to the right, then enemies should be moving to the left. If gravity pulls Mario down, then his jump should send him up. Game ideas should involve the primary function as much as possible. If the player must combine secondary functions with primary functions to progress, then the game idea is considered to be expanded. Lets look at world 1-1 as an example. As you can see, each section of level contains level elements and sometimes enemies. The level elements themselves impose a direction or game idea on the player (assuming the player is trying to beat the level/game). Mario is trying to live and reach the end of the level. The enemies are trying to stop Mario. And the level can help or hurt them both. This is what is meant by having game ideas that are at odds or by contrary motion. The pits, pipes, and blocks force Mario to jump. The Goombas and Koopas have a will and direction of their own as they move through a level without being tied to a stationary position within it. And Finally Mario (Small, Big, or Fire) has an independent direction as well. How these 3 types of game ideas layer and interact is the essence of videogame counterpoint. For now let's say there are four species or levels to counterpoint. elements/game ideas that are offset from each other with the ability to carry across sections: suspension. A combination of all previous levels. 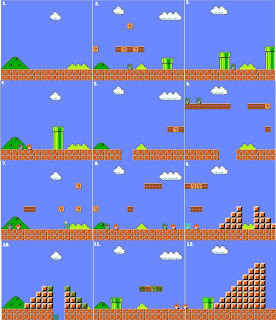 According to provided image, the first section (number1) doesn't have any counterpoint because there are no enemies and the level doesn't force Mario to Jump. Sections 5, 10, and 12 are good examples of the first species counterpoint. The elements in these sections are at odds are Mario and the level. The remaining sections are of the species 2 or 3 depending on the power-ups. A mushroom powerup (something that Mario wants) always runs off to the right. Because it's not affected by enemies, the Mushrooms pass right through them. A Mario in hot pursuit must maintain the chase while taking new paths by jumping in order to avoid getting hurt. So, Mario, enemies, the level, and the Mushroom (or Starman) make up the 3-4 game ideas that are at odds with each other. However, what's interesting about the mushroom is, it'll keep traveling as long as there's a stage to support it. So this one element can carry over into other parts of a level. Carrying over to other parts of a level is suspension. World 1-1 is a classic example of a beginning level of a videogame. As the player gets used to Mario's mechanics, the counterpoint remains relatively simple as none of the parts are expanded, requiring players to combine the jump mechanic with running or ducking. Next time, I'll discuss some of the types of combinations of elements/game ideas and why counterpoint is so important.